Jesús Lepe Rico, world-renowned pianist once again captivated the listeners with his piano performance. 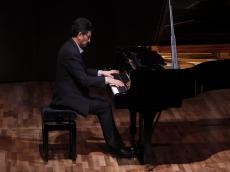 The Mexican pianist gave a concert at the International Mugham Center on November 26, Azertag reported. In his speech, Mexican Ambassador to the country Juan Rodrigo Labardini emphasized that the event was held to strengthen relationship between Azerbaijan and Mexico. Then, Jesús Lepe Rico walked onto the stage under the loud applause. The musician performed masterpieces of the famous composers Bach, Beethoven, Chopin, as well as some masterpieces of the significant Mexican composers. A brilliant, highly emotional and virtuosic concert fascinated the music lovers. The event was co-organized by the Embassy of Mexico in Azerbaijan and the International Mugham Center. Jesús Lepe Rico studied music at the Autonomous University of Tamaulipas and at the Universidad of Veracruz. He was awarded at the national level as a Tamaulipan artist of the year 2012 and has been a scholar on several occasions by the Universidad of Veracruz and the International Institute for Young Musicians during his career. The pianist has performed as a soloist in numerous stages in Mexico. He is a founder and general director of the Papantla International Piano Festival. In addition, he acts as a performer and director of the piano class of the Municipal Culture House.